No doubt about it, brain injury changes you. In some cases, a lot. Your personality can change dramatically… like mine did after my mTBI in 2004. I went from being a positive, pro-active individual with an indomitable spirit, to an anxious and easily upset “hothouse flower” who flew into a rage over every little thing. I went from being attentive to everything others needed from me, and going out of my way to ensure they were protected and well-cared-for, to being selfish, self-centered, and oblivious to what other people wanted and needed. 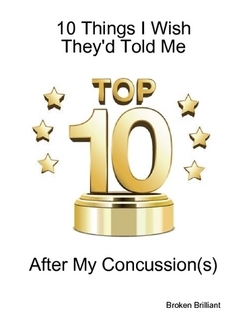 Granted, there were other mitigating factors that came into play, but the difference between pre-TBI and post-TBI was remarkable. I can say that now with some measure of calm, because after 12 years of really working on my recovery, I’ve made huge strides and am better off — all across the board — than I can ever remember being. But back in the day, my recovery wasn’t a foregone conclusion. It was questionable, in fact. The thing that made the difference for me was not giving up. Having help, in the form of a neuropsych who would just talk me through my week, every week, and let me sort things out. They would question me, when I was on the verge of going off the rails, helping me sort through the mass of details to find a common thread that I could hang onto. For just one more day. And over the years, one more day led to another and another and another, and those days became weeks and months and years… till I stopped to catch my breath and look around. And I realized I had come through on the other side. Everybody’s trajectory is different, of course. And along the way, we need to adjust. I had to let go of some dreams I’d had for such a long time. I had to let go of progress I’d made before my accident. I had to settle into a different life path. And I had to make peace with my losses. But that all led me to the light in the distance. And in the end, will not having every single dream come true make me less happy, less productive, less capable? Nope. That’s just how things go. I’ve accepted that, now. And it’s good. I was exaggerating my issues. I wasn’t. If anything, I was understating them. Getting hit on the head wasn’t a big deal. NO, it was a big problem. It nearly cost me everything I’d worked so hard for. My brain would just recover on its own. It didn’t. I had to work with it constantly to get it to a place I was happy with. It took years to do that. TBI recovery doesn’t happen. Obviously untrue. It did happen. These are just a few of the things I either read or was told. And I didn’t buy any of it. I knew I was in trouble, and I did everything in my power to fight for what I needed. What my brain needed. What my spouse and the life I’d built up all needed. So, let’s rethink brain injury, shall we? Yes, it’s serious. Yes, it takes a toll. But the damage is not irreversible, and it can be followed by incredibly recovery. How amazing would it be if everyone understood that. Glad you’re better and I agree completely. Thank you – and thank you. Reblogged this on Traumatic Brain Injury There is Support. Thanks – yes, there’s something to be said for being hard-headed. Of course, there’s always room for improvement, but remembering that keeps me always looking for better ways, and it keeps me humbled, as well. So important. Thanks again. Gist Reasoning Scenario 3 – Picnic in the Park – What Would Others Say? Gist Reasoning Scenario 4 – Getting Ready for Work – What Would Others Say? Brain Injury – What Is It? Have you experienced a brain injury? Of Self and Sense – What IS the Self? And What About the Sense-Of-Self? 3. Does The Self Actually Matter? 7. Why Not Just Let It Go? Broken Brain – Brilliant Mind Blog at WordPress.com.